DUBLIN, Ireland, Oct. 3, 2016 /CNW/ - Health Canada today granted approval for naloxone hydrochloride nasal spray, which is indicated for emergency use outside of a hospital to reverse known or suspected opioid overdose, as manifested by respiratory and/or severe central nervous system depression. Adapt intends to market this new product as NARCAN® Nasal Spray which provides a 4mg dose of naloxone concentrated in a small 0.1 milliliter spray. Designed with the general public and communities in mind, the product is a ready-to-use, needle-free alternative to currently available opioid overdose emergency treatments. "Adapt Pharma has cooperated with Health Canada throughout the approval process to expedite the approval of the naloxone nasal spray in Canada," said Seamus Mulligan, Chairman and Chief Executive Officer of Adapt Pharma. "It is our priority to equip first responders, including the general public, with the ability to potentially treat an opioid overdose, wherever it happens." Adapt Pharma submitted a New Drug Submission (NDS) to Health Canada for naloxone hydrochloride nasal spray on May 2, 2016. The opioid epidemic has taken center stage across Canada with reports indicating more than 410,000 instances of prescription drug abuse, including opioid pain relievers, in the country.ii British Columbia declared a public health emergency in April 2016 where 488 apparent illicit drug overdose deaths were reported from January to August 2016.iii Adapt Pharma is working with provincial health authorities to rapidly implement an appropriate delivery and distribution process for the naloxone nasal spray. 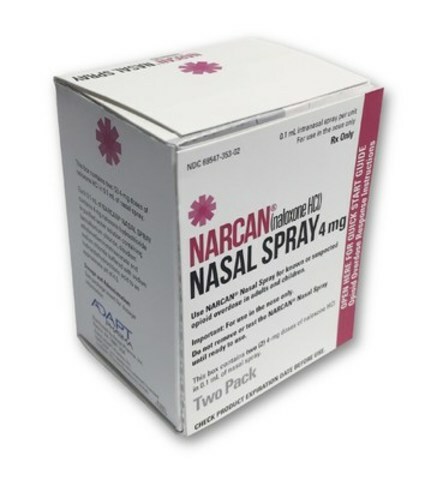 NARCAN® Nasal Spray is indicated for the emergency treatment of known or suspected opioid overdose, as manifested by respiratory and/or central nervous system depression. NARCAN® Nasal Spray is intended for immediate administration as emergency therapy in settings where opioids may be present. NARCAN® Nasal Spray is not a substitute for emergency medical care. Always seek emergency medical assistance in the event of a suspected, potentially life-threatening opioid emergency after administration of the first dose of NARCAN® Nasal Spray. If the desired response is not obtained after 2 or 3 minutes, administer an additional dose of NARCAN® Nasal Spray using a new NARCAN® Nasal Spray. If the patient responds to NARCAN® Nasal Spray and relapses back into respiratory depression before emergency assistance arrives, administer an additional dose and continue surveillance of the patient. If there is still no response and additional doses are available, administer additional doses of NARCAN® Nasal Spray every 2 to 3 minutes using a new NARCAN® Nasal Spray with each dose until emergency medical assistance arrives. Additional supportive and/or resuscitative measures may be helpful while awaiting emergency medical assistance. 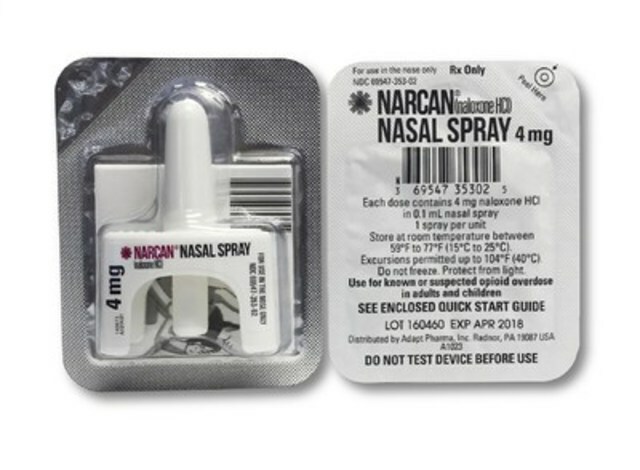 The availability of Narcan Nasal Spray in Canada under the Interim Order signed by the Minister of Health in July 2016 underpins the goal of Health Canada to expedite community access to naloxone and equip first responders and the general public with the ability to readily and rapidly reverse an opioid overdose. Retail and wholesale orders for NARCAN® Nasal Spray in Canada can be placed through GMD Pharma Solutions (gmd@customer-support.ca). Naloxone Hydrochloride Nasal Spray is a pure opioid antagonist indicated for emergency use outside of a hospital to reverse known or suspected opioid overdose, as manifested by respiratory and/or severe central nervous system depression. Naloxone Hydrochloride Nasal Spray can be administered by a bystander (non-health care professional) before emergency medical assistance becomes available, but it is not intended to be a substitute for professional medical care. Emergency medical assistance (calling 911) should be requested immediately when an opioid overdose is suspected, before administering naloxone. In the absence of opioids, in opioid naïve people, naloxone administration shows essentially no pharmacologic activity. In opioid dependent people, naloxone may trigger an acute opioid withdrawal syndrome (see WARNINGS AND PRECAUTIONS, Acute Opioid Withdrawal Syndrome). The effectiveness of naloxone has not been assessed in people with intranasal conditions such as abnormal nasal anatomy, nasal symptoms (i.e., blocked and/or runny nose, nasal polyps, etc.) or in people having a product sprayed into the nasal cavity prior to naloxone administration. It is unknown if these conditions affect naloxone's effectiveness. If Naloxone Hydrochloride Nasal Spray is procured with the intention of using it in people that may present these conditions, the pharmacist may suggest other route of administration (e.g. intramuscular). Naloxone does not counteract overdoses due to: barbiturates, benzodiazepines, psychostimulants (e.g., cocaine, amphetamines, methylphenidate, etc. ), alcohol, or any other non-opioid drug such as non-opioid tranquilizers, anesthetics or sedatives. However, mistakenly administering naloxone to a person that is unconscious because of a non-opioid overdose or for other reasons is unlikely to create more harm. Rebound opioid toxicity is the re-emergence of an opioid overdose manifestation, including respiratory depression, following the temporary reversal of the opioid overdose with naloxone. The patient who has responded satisfactorily to naloxone should be kept under continued surveillance and repeated doses of naloxone should be administered as necessary until the emergency medical services take charge of the patient (see DOSAGE AND ADMINISTRATION). Repeated doses are often required as the duration of action of most opioids exceeds that of naloxone, and therefore, re-emergence of opioid overdose manifestation is likely. Naloxone is not effective against respiratory depression due to non-opioid drugs (see WARNINGS AND PRECAUTIONS, General). A single dose of naloxone may not reverse respiratory depression (or reversal may be incomplete) if the opioid overdose is caused by certain partial agonist opioids such as buprenorphine and pentazocine or highly potent opioids such as fentanyl or its analogs. Additional doses of naloxone administered at close intervals may be required in such cases (see DOSAGE AND ADMINISTRATION, Recommended Dose and Dosage Adjustment). Similarly, an opioid overdose caused by very large doses of any opioid may also require administration of multiple doses of naloxone at close intervals (see DOSAGE AND ADMINISTRATION, Recommended Dose and Dosage Adjustment). 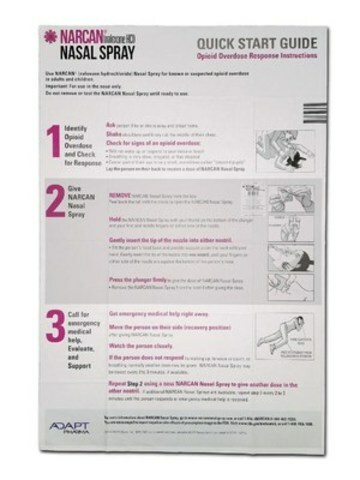 In addition to naloxone, other resuscitative measures such as maintenance of a free airway, artificial ventilation and cardiac massage could be executed by a bystander (non-health care professionals) if the bystander knows how to perform the manoeuvres. Moreover, vasopressor agents should be employed (if available) whenever necessary if a health care professional is present. Naloxone Hydrochloride Nasal Spray should be administered with caution to persons who are known or suspected to be physically dependent on opioids. In such cases, an abrupt reversal of opioid effects may precipitate an acute opioid withdrawal syndrome. The severity of such a syndrome will depend on the degree of physical dependence, the dose and potency of the opioid that induced the overdose, and the dose of naloxone administered. The signs and symptoms of an acute opioid withdrawal syndrome include, but are not limited to: body aches, pain, fever/pyrexia, sweating/hyperhidrosis, runny nose, sneezing, piloerection, yawning, weakness, asthenia, shivering, chills, tremor/trembling, convulsions/seizures, nervousness, restlessness, irritability, aggressive behavior, diarrhea, nausea, vomiting, abdominal cramps, increased blood pressure, and tachycardia. In the dependent neonate, signs also include excessive crying as well as hyperactive reflexes and the acute withdrawal may be life-threatening if not recognized and properly treated (see WARNINGS AND PRECAUTIONS, Special Populations, Pediatrics). Emergency medical assistance (i.e., calling 911) should be requested immediately when an opioid overdose is suspected. Monitor the patient for the development of the signs and symptoms of opioid withdrawal. Caregivers administering naloxone to any patient should always be prepared for potential reactions associated with acute opioid withdrawal syndrome and to assist the patient to minimize harm when experiencing these reactions. For example, a patient should be positioned in lateral decubitus to prevent choking if vomiting occurs; sharp or dangerous objects should be moved away in case of convulsions to protect the patient from injury, but the patient should not be restrained. Rare cases of cardiac arrest, tachycardia and ventricular fibrillation have been reported after naloxone administration. These cases may have been confounded by the effects of other drugs or other effects such as prolonged hypoxia. A direct relationship to naloxone has not been established. Several instances of hypotension, hypertension, ventricular tachycardia and fibrillation, dyspnea, pulmonary edema and rare cases of cardiac arrest have been reported. Death, coma, and encephalopathy have been reported as sequelae of these events. These events have primarily occurred in post-operative patients with pre-existing cardiovascular disorders and/or other drugs may have contributed to the adverse effects. A direct relationship to naloxone has not been established. Convulsions or seizures after naloxone administration have been rarely reported and the relationship between naloxone and convulsion or seizure is unclear. If convulsions or seizures occur, sharp or dangerous objects should be moved away to protect the patient from injury but the patient should not be restrained. Irritability and aggressive behavior are among the manifestations of an acute opioid withdrawal syndrome, which may be precipitated when naloxone is administered to a person who is physically dependent on opioids (see WARNINGS AND PRECAUTIONS, Acute Opioid Withdrawal Syndrome). 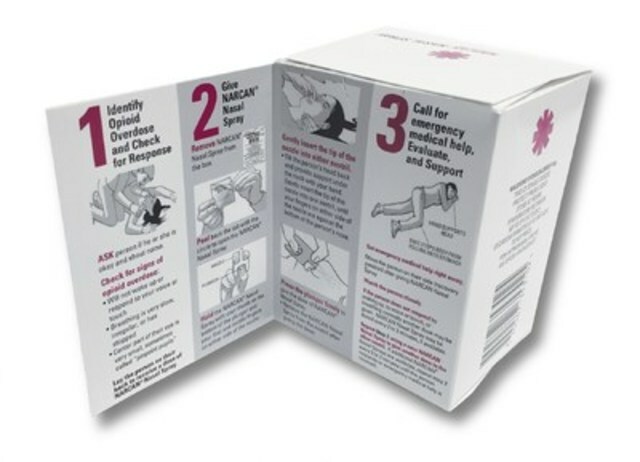 Caregivers administering naloxone to any patient should always be prepared to manage potential aggressive reactions. Naloxone administration could trigger gastrointestinal reactions including diarrhea, nausea, vomiting and abdominal cramps (see WARNINGS AND PRECAUTIONS, Acute Opioid Withdrawal Syndrome). If vomiting occurs, the patient should be positioned in lateral decubitus to prevent choking. Pregnant Women: There are no adequate and well-controlled studies in pregnant women. Reproduction studies performed in mice and rats at doses up to 12 times the human dose revealed no evidence of impaired fertility or harm to the fetus due to naloxone. Administration of naloxone to an opioid-dependent pregnant woman may induce an acute opioid withdrawal syndrome (see WARNINGS AND PRECAUTIONS, Acute Opioid Withdrawal Syndrome), which may precipitate preterm labor or fetal distress. Because of this risk and because animal reproduction studies are not always predictive of human response, naloxone should be used during pregnancy only if clearly needed (see DOSAGE AND ADMINISTRATION). Nursing Women: It is not known whether naloxone is excreted in human milk. Studies in nursing mothers have shown that naloxone does not affect prolactin or oxytocin hormone levels. Pediatrics: An accidental opioid exposure is possible in the pediatric population. Naloxone administration may cause an acute opioid withdrawal syndrome which may be life threatening in opioid dependent neonates if not recognized and properly treated (see WARNINGS AND PRECAUTIONS, Acute Opioid Withdrawal Syndrome). Clinical data is limited and naloxone should be administered to a neonate only if clearly needed (see DOSAGE AND ADMINISTRATION). As for any use of naloxone, emergency medical assistance (i.e., calling 911) should be requested immediately, before administering naloxone in a neonate. Geriatrics (> 65 years of age): Geriatric patients have a greater frequency of decreased hepatic, renal, or cardiac function and of concomitant disease or other drug therapy. Therefore, the systemic exposure of naloxone hydrochloride can be higher in these patients. Clinical studies of naloxone hydrochloride did not include sufficient numbers of subjects aged 65 and over to determine whether they respond differently from younger subjects. Other reported clinical experience has not identified differences in responses between the elderly and younger patients. You can help improve the safe use of health products for Canadians by reporting serious and unexpected side effects to Health Canada. Your report may help to identify new side effects and change the product safety information. Postage paid labels and the Consumer Side Effect Reporting Form are available at MedEffect. Adapt Pharma is a privately-held pharmaceutical company committed to positively impacting the lives of patients. Adapt Pharma's strategy is to identify, evaluate, selectively acquire and enhance the value of late stage development, and FDA approved, pharmaceutical products. Adapt Pharma's company headquarters is in Dublin, Ireland and its U.S. headquarters is in Radnor, Pennsylvania, and has an office in Mississauga, Ontario, Canada. For more information, please visit www.adaptpharma.com. For questions regarding NARCAN® Nasal Spray distribution in Canada, please call 1-877-870-2726.